Candidate Harley Rouda talks with supporters and former candidate Laura Oatman at his election night event at The Ranch in Laguna Beach. The narrow roller coaster race for second place in California’s 48th Congressional District, which includes Newport Beach, had another switch-up this week. 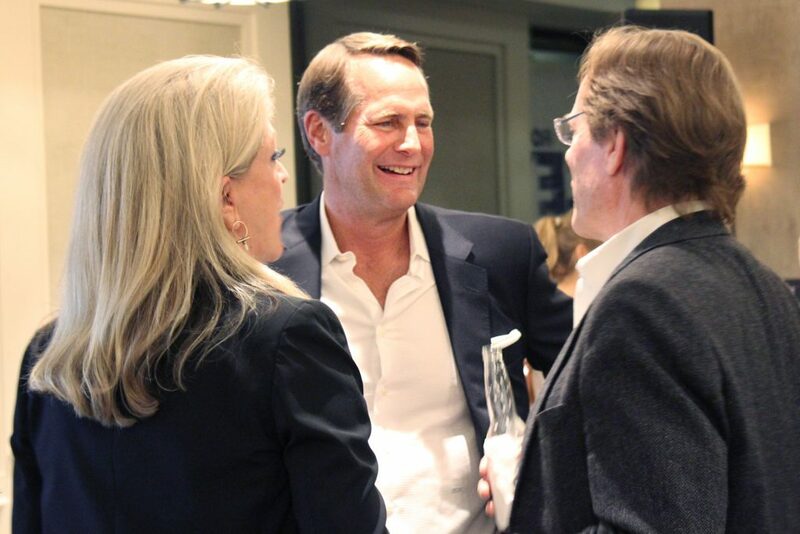 Monday’s update caused Hans Keirstead and Harley Rouda, both Democrats from Laguna Beach, to again swap places, leaving Rouda in the coveted number two spot and likely headed to face-off against longtime incumbent, Republican Dana Rohrabacher, in November. As of Friday morning, Rouda had a slight lead with 30,016 votes, or 17.3 percent. Keirstead trailed closely behind with 29,919 votes, or 17.2 percent. The gap had widened slightly since Wednesday night, when Rouda had 29,924 votes and Keirstead with 29,862. They are “on track to win,” Rouda’s Campaign Manager Michael McLaughlin wrote in a newsletter on Wednesday. “I don’t have to tell you that every vote counts,” McLaughlin pointed out. Both Rouda and Keirstead emphasized the importance of every single vote being counted. “We want to make sure every voter has their voice heard and their vote counted during this process,” Keirstead said. The OC registrar’s office expects the election results to be certified on Monday. The numbers may change each day until all of the paper and provisional ballots are counted. On Wednesday evening, there were an estimated 19,397 ballots left to count. Rouda’s newsletter also noted that every donation counts and asked supporters to contribute. The link led to a donation page for “recount fund” for Rouda. “We’re building a team to ensure that every vote is counted,” the page reads. Keirstead previously said on social media that the numbers will continue to fluctuate and there are still many ballots yet to be counted in the district. 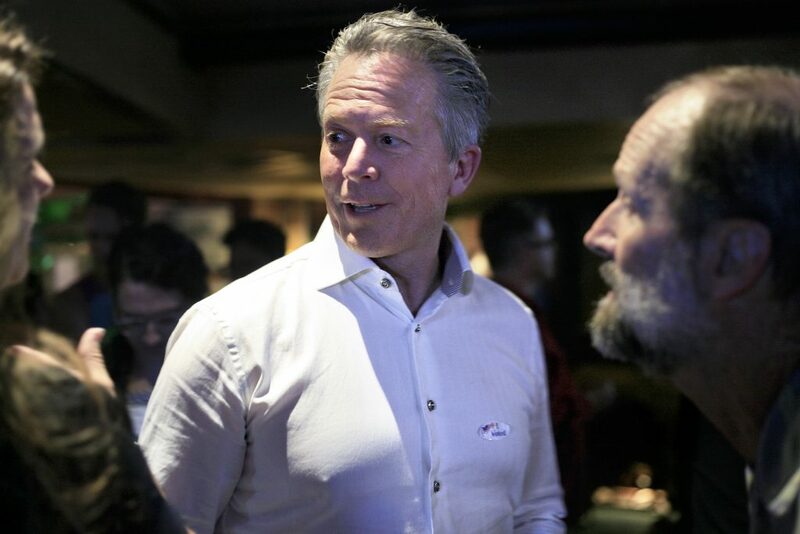 Candidate Hans Keirstead chats with supporters during his primary election event at Muldoon’s Irish Pub on June 5. “It’s extremely important we respect and allow the process to continue,” Keirstead wrote. Patience and kindness are needed right now, he noted. “We’ve got a nailbiter of a race here,” Keirstead noted on June 13. Keirstead pointed out on Monday that either way there will be a Democrat on the ballot to challenge Rohrabacher in November. A sentiment both he and Rouda have echoed. “Whoever prevails will need the support of a united party behind them,” Keirstead concluded. 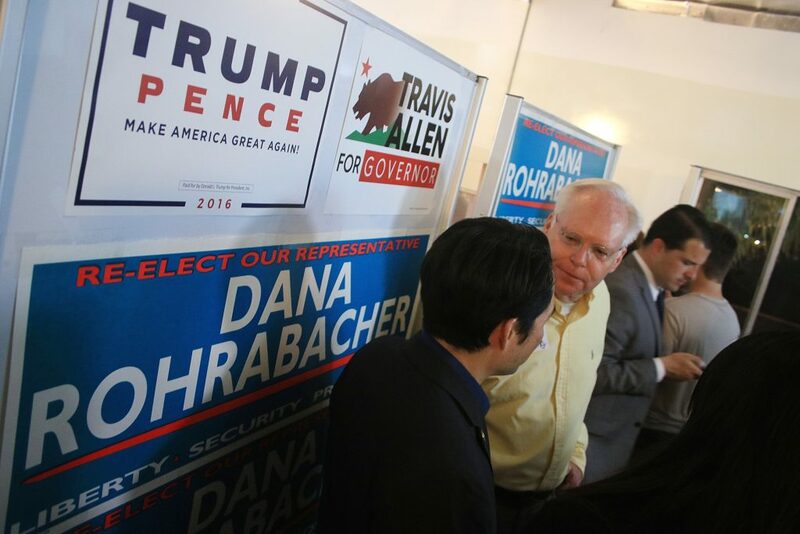 Although both have mentioned that they would love to face Rohrabacher in the general election in November, they agreed that defeating the 30-year incumbent is the top priority. Another GOP candidate, Huntington Beach Republican Scott Baugh, landed in a not too distant fourth place in the race for 48. As of Wednesday, Baugh had 27,453 votes, or 15.8 percent. It was close between the three candidates as count updates rolled in throughout the night of June 5. Supporters of Republican incumbent Dana Rohrabacher chat as they wait for updates on the election at Rohrabacher’s event on June 5. On election night, while Rohrabacher easily stayed in the lead, the gaps between the three continued to narrow. The last count of the night, at midnight on June 5, switched things up, leaving Rouda in the coveted second place position and moving Keirstead, who had held onto the number two spot all night long, ever so slightly down into third. He stayed on top until earlier this week, after many of the provisional ballots were counted and Rouda moved back up on Monday. Baugh, who ended election night fourth in line, conceded the next day and endorsed Rohrabacher on June 6. He encouraged residents to vote for the GOP incumbent in November. Rohrabacher still had a significant lead on Wednesday night with 52,596 votes, or 30.3 percent. 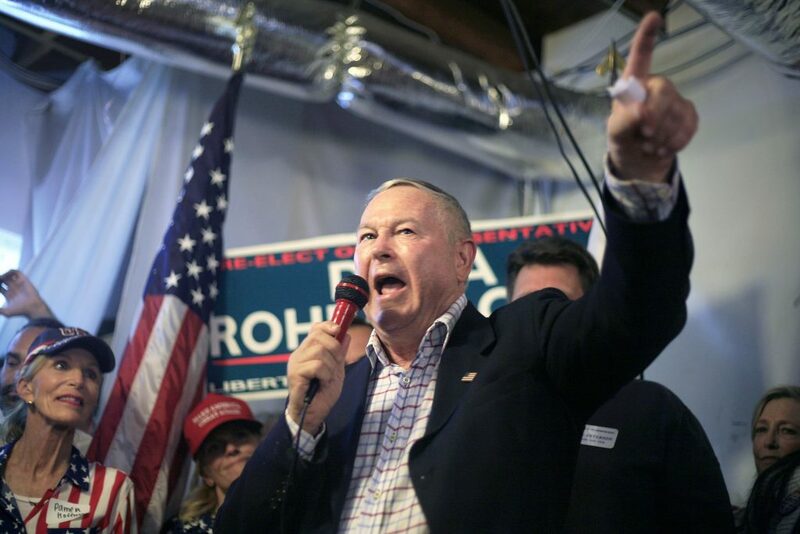 Republican incumbent Dana Rohrabacher gives a speech in front of an excited crowd during a primary election night event at his campaign headquarters in Costa Mesa on June 5. The vote counts will not affect the first-place finish for Rohrabacher, who addressed supporters at an event on June 5. “This is not a victory for me, it’s a victory for America,” Rohrabacher said to a crowd of about 100. In his speech, Rohrabacher mentioned beating out the “left-wing fanatics” in the “jungle primary” and “taking back America.” The tide has changed on the “Blue Wave,” Rohrabacher said. Newport Beach voters also considered candidates for the 74th Assembly District race. As of Friday morning, Huntington Beach Republican incumbent Matthew Harper had a significant lead with 41.7 percent of votes. Democrat Cottie Petrie-Norris followed with 28.2 percent. Also on the ballot for Newport Beach residents was the role of Orange County Supervisor for District 2. Republican incumbent Michelle Steel has an untouchable lead with 63.4 percent on Friday morning. In the second spot is Democratic Brendon Perkins with 24.6. For more information, visit ocvote.com.